Even for adults, pronouncing words like “cumulonimbus” can be a challenge, but six-year-old Giselle Osorio is undeterred. Glue sticks, cotton balls and blue crayons in hand, Giselle and her partner go over some cloud facts on a study card, then start figuring out how to draw it. They are determined to represent this particular formation accurately. We are at the East Salinas Family Center, home to the Life Is For Everyone (LIFE) after-school program, hosted for the last 18 years by the local mission of the United Methodist Church. The building is in the very heart of the Alisal, a densely-populated, predominantly immigrant Latino neighborhood, where the back-breaking labor residents provide fuels the multi-billion dollar agricultural industry of the Salinas Valley. “The LIFE program was the brainstorm of a group of five pastors in the late 1990’s,” explains board member Lynne Nielson. Recognizing their churches were often empty during the week, the group started five separate tutoring programs for young people with nowhere to go after school. Incorporation soon followed, allowing individual churches to accept donations. Fundraising and staffing were always hurdles, however. Over time it became clear that East Salinas had the greatest need, so the group concentrated their efforts there. “Even though they were struggling,” says Nielson, Rev. 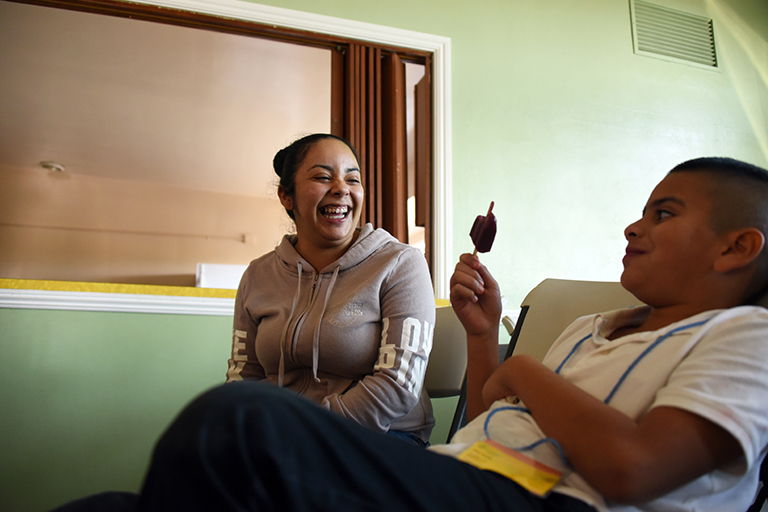 Frank Gomez and his wife Sandra took on the remaining program at the newly-formed East Salinas Family Center. Set well back from the road on a large piece of land, the church, painted a gentle light green, is welcoming in the late afternoon sun. Inside, the program is buzzing with activity. Kids have just been outside, participating in a weather game about how sound is perceived, and they are ready to learn more. Today’s lesson is the first of a 12-week California Academy of Sciences curriculum called “Cloud Quest,” part of NASA’s citizen-science initiative to study how clouds affect climate. 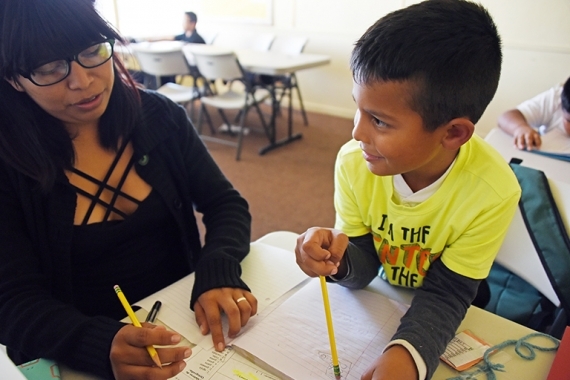 At the East Salinas Family Center, where the LIFE program is housed, tutor Paola Chepe helps six-year-old Cristofer Zarate with his Spanish vocabulary. LIFE Program Manager Anahi Alcibar was able to attend training for the sessions, and she’s as excited as the kids are to get started. “We have 45 to 50 elementary and middle-school students during the year,” says Alcibar, who is in her third year at LIFE. “A lot of them come because their parents work long hours in the fields, and they don’t know how to help the students with their homework, or the parents don’t how to read or write in Spanish and they are not able to help.” Alcibar walks the kids slowly through the first Cloud Quest Mission, to design and build a cloud model. The science curriculum is welcome. Acknowledging a need for improvement, area educators have embraced giving kids additional chances to study science, technology, engineering and math (STEM) subjects, fields in which Latinos, African-Americans, and women are underrepresented. “What do you think clouds tell us about our environment?” she asks the group. Hands go up rapidly. “How the day is going to be,” says seven- year-old Gabriela Regalado, who is wearing a NASA t-shirt, proudly stating her perfect attendance at Alisal STEM Academy. Participating students clearly benefit from the support they receive five days a week at LIFE, where bilingual tutors and volunteers provide individual help with schoolwork, healthy food for snacks, and a safe place to learn, play, and socialize. There are outings, projects, birthday celebrations, even a garden where kids grow vegetables with Gio Jimenez, brother of Rudy Jimenez of Green Thumb Organics and member of Urban Arts Collaborative. Tutor Eycsel Solorzena shares a laugh with young Isaac Santos during snack time at the LIFE after-school program in East Salinas. Parent Laura Hernandez has four children, two of whom, ten-year-old Betzy and seven-year-old Roberto, are in the program. Sitting in the office talking about next week’s field trip to Big Sur, she is happy with the progress they are making. “This program has helped Betzy a lot,” she says in Spanish, “because she didn’t speak much English. Now she’s doing better. Also, Roberto didn’t read enough, but now he’s also improving.” At his mom’s shoulder, Roberto breaks into a smile when his name is mentioned. “They know they’re making a difference to the planet,” she says, as the LIFE program is surely making a difference in theirs. 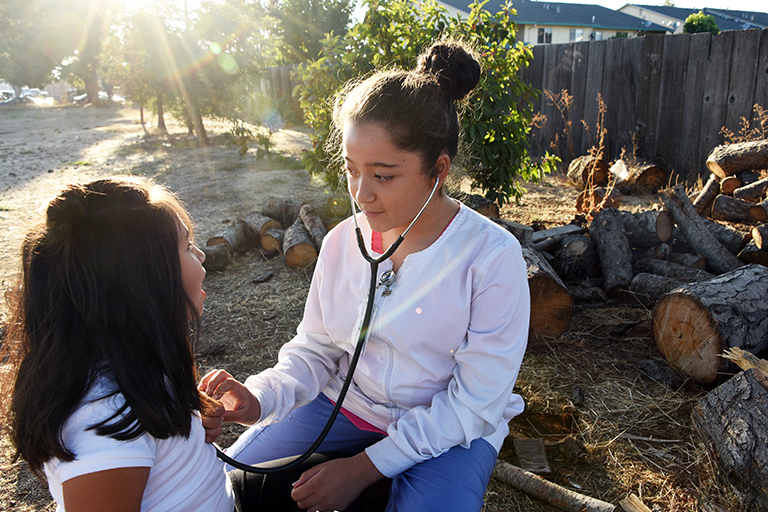 On a sunny afternoon before Halloween, Giselle Osorio, 6, is a willing patient for doctor-in-training Noemy Sanchez, 9, during playtime at the LIFE after-school program in East Salinas. For more information about the Life Is For Everyone (LIFE) after-school program, visit www.lifeisforeveryoneinc.org.